Happy 20th Birthday, Heinz Architectural Center! 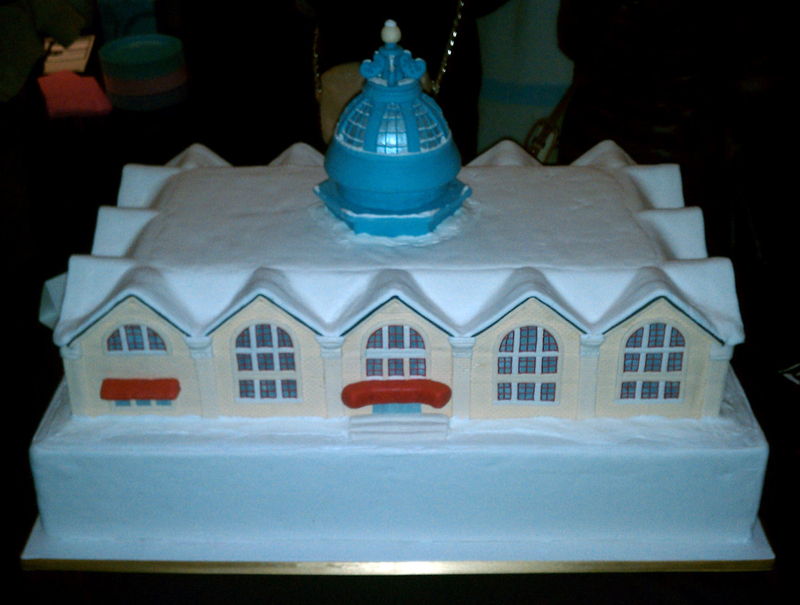 Saturday, February 9th was the 20th birthday celebration for the Heinz Architectural Center. They celebrated by inviting five groups to work with five bakeries to create cake architecture, or CAKEitecture . Sound fun? That’s what I thought too, and so did everyone who has ever heard of architecture or cake. Trying to see the cakes was like trying to catch a Tokyo subway train at rush hour, with slightly less public groping. Also, I’m pretty sure the people in line to eat the cake were misinformed. This was not the last cake ever to be made on this earth, and thus no need to straight-up shank a man for a slice. But it was all worth it to eat a tiny piece of delicious cake, with all the elbow room you might find at a Justin Bieber concert. If you were one of the 6 or 8 people that I didn’t see last night, let me fill you in on the entries and winners. 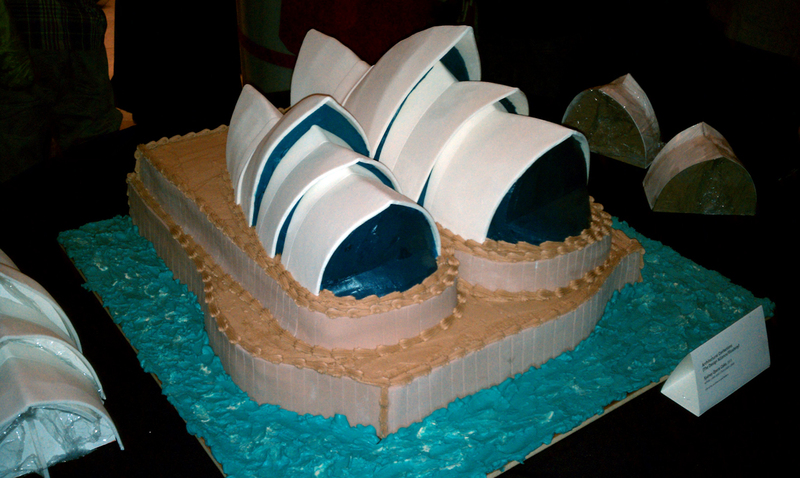 The Design Alliance collaborated with Gluuteny to create a cake version of the Sydney Opera House with less gluten than the real Sydney Opera House. Kudos to this team for actually bringing enough cake to feed anyone who wasn’t willing to mosh in order to get some. Fun fact: this cake was designed 17 years ago, it just took this long for cake-building technology to catch up. I was sad to see this creation by Springboard Design and Sugar ‘N Spires get snubbed for an award. Not only is Sugar ‘N Spires from Millvale, but regular readers of the blog know I never shut up about process. 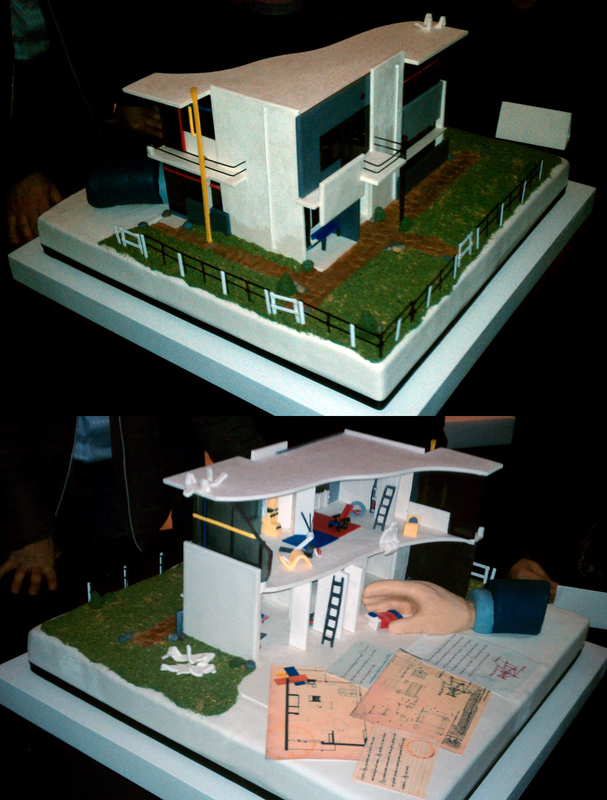 This cake not only featured a modernist gem, but also showed some of the sketching and drawings behind it. Plus, sectional models are bomb. A delicious day in the neighborhood! My winning vote would have been between Rietveld ReWind and this on, presented by the Young Architect’s Forum with Dozen Bakery. I may be biased, considering I am one of those Young Architects, but look at that cake. If you’re not impressed now, what if I told you the trolley moved? The judges were impressed enough to award third prize to this cake, and this entry also won the people’s choice award. Congratulations YAF! 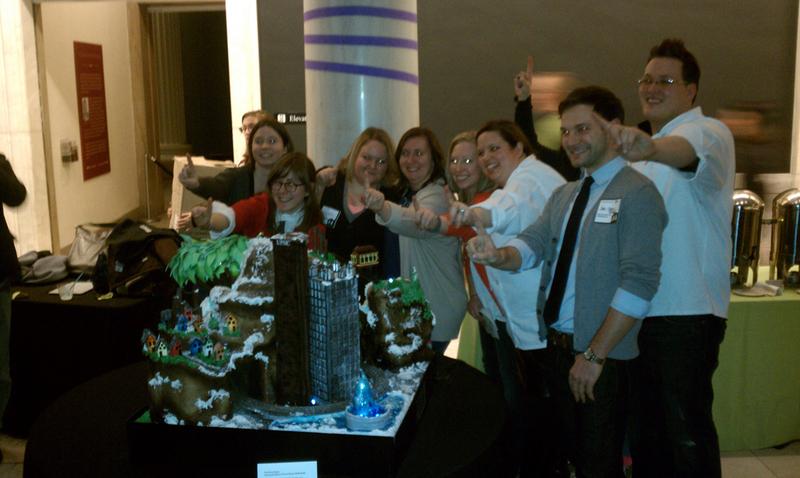 Second place went to Perkins Eastman and Madison Ave Cakes for their rendition of Motor Square Garden. I’m torn between writing one perfectly succinct sentence that exactly encapsulates this cake and throwing in some filler just to flesh this one out. Well, I guess this settles it. 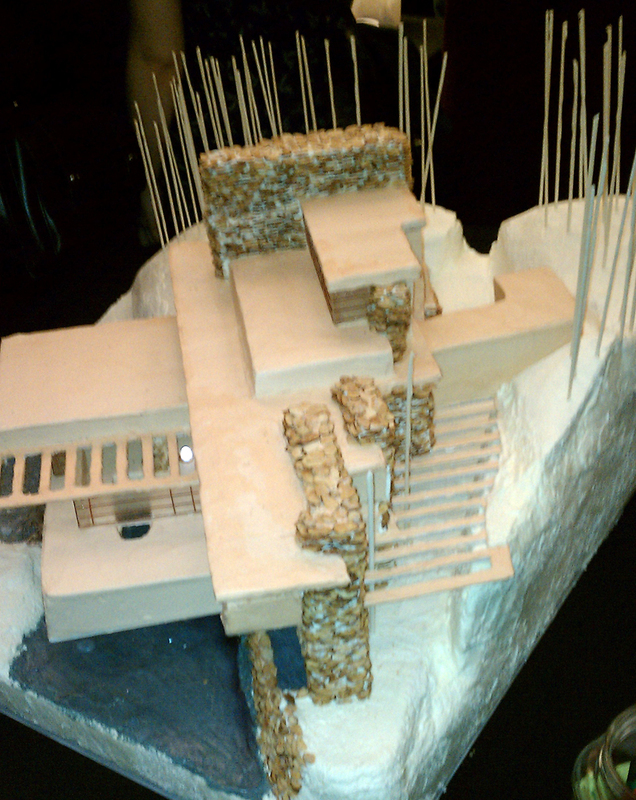 The judges chose Loysen + Kreuthmeier Architects and Prantl’s Bakery to carry the night. Rumor has it the concept for this cake was the product of an intense brainstorming session. One of those brainstorming sessions where you realize that you had your best idea in the first 5 minutes. 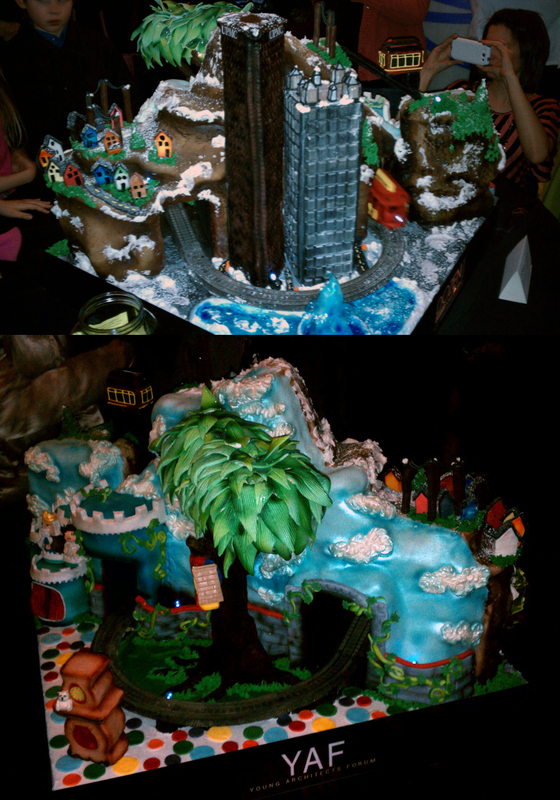 However, my completely terrible photo notwithstanding, this cake was very impressively crafted. Plus it’s Prantl’s, so I’m sure it was delicious, too. Congrats to the LK team on the winning cake. All of the cakes were amazing, and I’m sure took forever to plan and make. Thanks for all the hard work from the participants, and here’s to many more great years for the Heinz Architectural Center. And for those of you keeping track, the word “cake” was used 22 times in this post, a new record! I deemed constant repetition of the word “cake” less annoying than snobby synonyms like “confection” and “sweet bread-like dessert, usually iced”. This entry was posted in Architecture and tagged Architecture, Cooking, Design, Humor, Lists, Museums, Process. Bookmark the permalink. I’m not sure who the others were, but Charles Rosenblum was one of the judges. I’ll have some words with him. I feel like I should crack my knuckles now.